Steve Martin and Goldie Hawn are Henry and Nancy Clark, and although Nancy does't know it, they are in town for a job interview. And now that their last child has moved out, Nancy isn't sure what to do with the rest of her life. 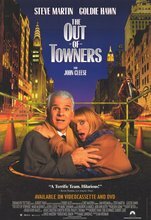 The two blunder through New York in this uninspired remake of Neil Simon's The Out-of-Towners (1970).